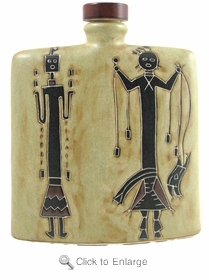 This Mara Stoneware 24oz Square Decanter - Yei Indian is a smaller version of the Yei Indian drawing depicted on the decanter. History shows us that this kind of drawing was found on the walls of caves. Just a quick glance of history captured on this decanter. This is the 24oz twin of the Mara Stoneware 44oz Tall Rectangular Decanter - Yei.